THE SOOKIE STACKHOUSE COMPANION is a unique guide to Sookie Stackhouse and her dark fantasy southern-Gothic world, as well as an in-depth look at the award-winning HBO series TRUE BLOOD. The book will feature a brand-new Sookie story and Charlaine's own map of Bon Temps. Other treats include: an introduction by Charlaine about the impact Sookie Stackhouse has had on her writing career and the influence on the genre at large; a large section on the award-winning HBO series True Blood; detailed summaries of each novel and entries on every important character, event and setting in the series, in Sookie's voice; an overview of Sookie's world, including information on the vampires, shapeshifter/wereanimal and fairie factions; interviews with Charlaine Harris and Alan Ball, as well as a selection of favourite Bon Temps recipes. As you probably already know, I'm a huge Sookie Stackhouse fan. I love reading her stories, love the world, the many characters, and just losing myself in the latest installment. So, when I found out The Sookie Stackhouse Companion was going to be released, I couldn't wait to check it out! I've been taking my time, slowly making my way through it during the last few weeks. It's jam-packed full of very interesting things about this world. I really enjoyed reading Charlaine's input into not just her writing process, but also how she eventually got Sookie out there into the world. I love reading the behind-the-scenes stuff, and there's plenty here. Not just about Charlaine and her many worlds, but also about the True Blood TV show and why Alan Ball loved it so much he had to make it a show. There's some very cool stuff here--lots of valuable information. Another thing that I particularly liked is the Life In Bon Temps section, which pretty much summarises all of the Sookie stories in order. This means that when hubby asks me if the latest True Blood season is (even remotely) close to the book, or I want to remind myself, I don't need to skim through the actual books, I can just check it out here. Awesome! Oh, and after each book summary there are some conversations, notes, and emails between Eric and Bill, which are a great way to fill in the blanks of what's going on behind Sookie's back. Very cool. There's also a new story included in this Companion. I really enjoyed this tale, and read it in one sitting. I particularly enjoyed spending time with Sam and Sookie, just being friends. Also, the closure she finally finds with Quinn was a great touch to the story. 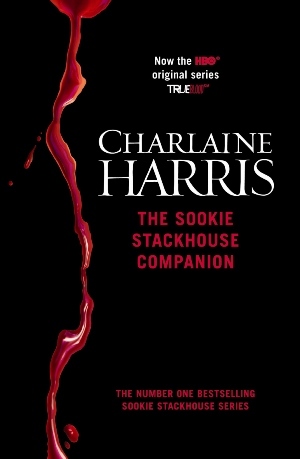 Just like everything else in Sookie's world, The Sookie Stackhouse Companion is another excellent addition to this fantastic series. I had a blast reading it, enjoyed the author's insights, and I'm pretty sure that I'll be referring back to this book in the future.